NATIVE STATE | DESIGN CO. 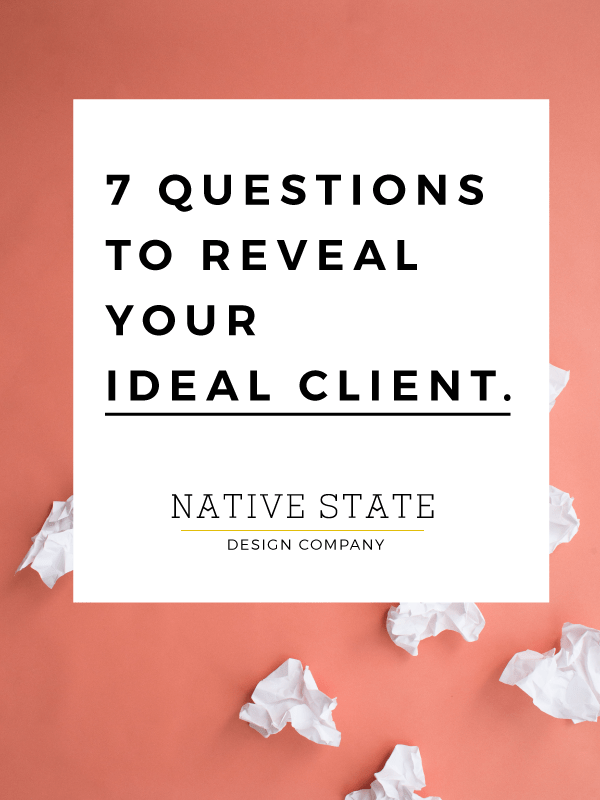 Seven Questions to Reveal Your Ideal Client – NATIVE STATE DESIGN CO.
It’s important to have a specific understanding of who your ideal client is so that you and your brand designers can build an effective brand strategy. You need to make sure your branding properly expresses what you do, what you charge, and even more importantly, who your services or products are for. If you can’t visually connect with your clients, your business will have a hard time growing. These are some questions that we ask our own branding clients to help them identify the audience we are trying to reach. Use them to discover your ideal client, too. If your product is hip handmade jewelry, your client age range most likely won’t be 50-80 years old. If you sell workshops on how to raise chickens, your ideal age range might be wider. Be as specific as possible in the age range you identify, because an effective strategy needs be laser focused on the right client. Also keep in mind that just because you are focusing on 20-30 year olds, that does not mean you will alienate potential 40 year old clients. For example, look at Madewell. They are clearly targeting girls in their 20’s, but I know many women in their 30’s and 40’s that still buy their clothing. 2. What sort of media does your client consume? If she’s young, she’s likely consuming social media, watching Netflix, and reading blogs. If she’s older, she probably reads magazines, listens to the radio, and watches cable TV. If you want your marketing to reach your ideal audience, you have to know where to find her. 3. Where does your client shop/spend his leisure time/hang out? If your client shops at stores like J. Crew, loves golfing and hangs out in sports bars, you won’t reach him with edgy hip branding. You’ll also know where and how to reach him. Know where you clients spends time tells you where to drop flyers or business cards, or if you ought to spend your promotional efforts on social media, instead. If you know exactly what sort of person your client is, you can tailor everything about your client’s experience with your brand, website, and customer service to attract and retain that client. 4. Is your ideal client single/married/a family? This is important to know because reaching a teenaged single woman requires a different strategy from reaching a busy mom. Think about what life stage your client is at, how much time they may have to interact with your business, and what services or products they really need/want based on their family situation. 5. How much does your ideal client spend on your services? Your brand strategy must reflect the dollar amount your services are worth. There is a reason people spend more on a Lexus vs a Camry or a top-shelf liquor vs Old Grandad. If you know what your ideal client will spend on your services, you can make sure your brand fits your price point and doesn’t attract clients who are only willing to pay less than you are worth. 6. Is your ideal client male, female, or a mix? For a restaurant, your ideal client is probably a mixture. However, if your business is hair & makeup, you obviously are catering to a female market. If you sell luxury neckties, your strategy is to attract mainly men. This obviously effects your brand strategy so that you can make sure you are too feminine, too masculine, or too nondescript to reach your client. 7. Where does your client live? Is it a family in the country with plenty of room for your custom built chicken coops, or a married couple living in a small urban apartment who need small, well-designed furniture? Is he a young professional working downtown who eats lunch a high-end restaurants or is she a suburban herb gardener who needs a good gardening blog? Where someone lives tells you a lot about their lifestyle and needs. This is valuable information you need to know to construct an effective brand strategy. 8. What is most important to your client? If she’s a busy mom, is it making easy but healthy meals? If she’s a bride, is it having the most stress-free wedding planning experience possible? If he’s a quality conscious fashionable young professional, is it finding well-made classic leather boots? Make it point to ask this question during exit interviews or closing surveys if you have the opportunity, because it makes a big difference in the way you should structure your brand strategy. If you can use these questions to create a specific, detailed profile of your client, you will be able to reach them effectively, charge what you are worth, and you’ll be giving your brand designer a huge gift. This will also help you understand what your brand ought to be, what your goals in all aspects of marketing and client interaction should look like, and what sort of design will appeal to this client. Were these questions helpful? Did I miss any important questions in this list? Do you know your ideal client?